The Avro 504 was a World War I biplane aircraft made by the Avro aircraft company and under licence by others. Production during the War totalled 8,970 and continued for almost 20 years, making it the most-produced aircraft of any kind that served in World War I. Over 10,000 were built from 1913 to the time production ended in 1932. Small numbers of early aircraft were purchased both by the Royal Flying Corps (RFC) and the Royal Naval Air Service (RNAS) prior to the start of World War I, and were taken to France when the war started. One of the RFC aircraft was the first British aircraft to be shot down by the Germans, on 22 August 1914. The pilot was 2nd Lt. Vincent Waterfall and his navigator Lt Charles George Gordon Bayly (both of 5 Sqn RFC). The RNAS used four 504s to form a special flight in order to bomb the Zeppelin works at Friedrichshafen on the shores of Lake Constance. Three set out from Belfort in north-eastern France on 21 November 1914, carrying four 20 lb (9 kg) bombs each. While one aircraft was shot down, the raid was successful, with several direct hits on the airship sheds and the destruction of the hydrogen generating plant. Soon obsolete as a front-line aircraft, it came into its own as a trainer, with thousands being built during the war. The major production types being the 504J and the mass production 504K, designed with modified engine bearers to accommodate a range of engines in order to cope with engine shortages. 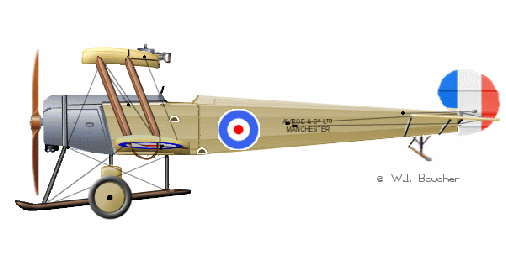 In the winter of 1917–18 it was decided to use converted 504Js and 504Ks to equip Home Defence squadrons of the RFC, replacing ageing B.E.2Cs, which had poor altitude performance. These aircraft were modified as single-seaters, armed with a Lewis gun above the wing on a Foster mounting, and powered by 100 hp (75 kW) Gnome or 110 hp (80 kW) Le Rhône engines. 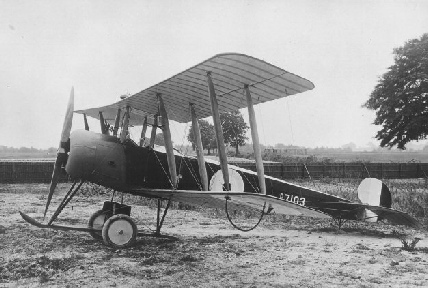 274 converted Avro 504Js and Ks were issued to eight home defence squadrons in 1918, with 226 still being used as fighters at the end of WW1. Adapted from various sources including Wikipeadia.